Does your child’s sports club, school or group have a ‘No Mouthguard, No Play’ policy? This is the question asked by Dental Prosthetist, Diane Tozer of Westside Dentistry, Brisbane. She reports that although the Australian Dental Association and Sports Medicine Australia, collaborated to develop this policy back in 2015, far too many of our young people are either playing sport with no mouthguard at all or are wearing an ill-fitting off the shelf, ‘boil and bite’ type. She goes on to re-iterate the advice of Dr Peter Alldritt, chair of the Australian Dental Association’s Oral Health Committee who pointed out that not all mouth guards provide sufficient protection for the wearer and may have the potential to cause more damage. Dr Alldritt urges all adults and the parents of children participating in sports to have a custom-made appliance fitted as these are the only type that dentists recommend. Arrange your appointment at Westside Dentistry, a leading supplier of custom mouthguards and dentures Brisbane, by calling today on 07 3278 0580. Commit to reducing the risk of dental trauma and help to spread Sports Medicine Australia’s ‘Safer Sport’ message by following the guidelines of the ‘No Mouthguard, No Play’ policy and wearing a protective sports guard at all times, during practice and matches. Dr Peter Alldritt highlights the fact that thousands annually receive treatment for dental injuries that could potentially have been avoided, had they been wearing an appropriate custom-made mouthguard. These custom fitted sports guards protect the face and jaw, as well as the teeth, and provide protection against concussion and injuries to the base of the skull. Because they are more comfortable than the ‘boil and bite’ type, children especially, are more likely to wear them. Although we probably think of the need for this type of protection during contact sports such as football, rugby, hockey or martial arts, for example, there are many sports where an accidental collision, fall or impact could result in injury without one. These can include netball, horse riding, snow sports, cricket, etc. – the list goes on! While more than 90% of coaches advocate their players wear a protective sports guard, only around 60% comply and many do not wear their protective appliance during practice sessions. All sports clubs are being encouraged to sign up to the ADA/SMA Mouthguard Policy and to require their members to wear one. There are many who still choose an ‘off the shelf’ sports guard rather than a custom fitted appliance, despite the fact these provide the best protection from injury, are more comfortable, and allow for unimpeded breathing and speech. Less Expensive In The Long Run! Diane Tozer advises that even a minor repair to a damaged tooth is likely to be more expensive than a custom-fitted mouthguard. The human cost of not wearing one, in terms of the painful and potentially disfiguring injury and the need for complex and expensive dental treatment to repair the damage, not to mention the need for time off from work or school to recuperate is far greater still. With statistics showing that sports participants are up to 60 times more likely to experience a facial or oral injury if not wearing a sports guard, make the right decision; protect all the sporting members of your family from the risk of an accident to the face, teeth or jaw. Call Westside Dentures Brisbane today and arrange an appointment to have a custom-fitted mouthguard made today. 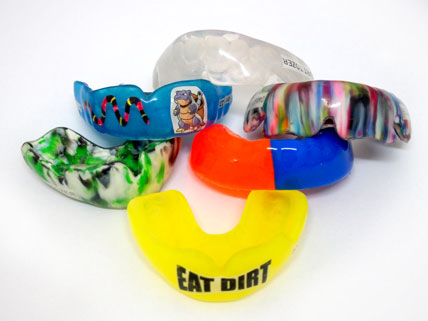 Request an appointment now to have your custom made mouthguard at no cost to you. Custom made mouthguards offer the highest level of protection, and if you have dental cover under your health insurance there's no out of pocket expense. Don't Let Those Teeth Go Unprotected! 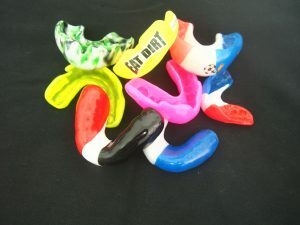 Request an appointment now to have a custom made mouthguard made at no cost to you. Custom made mouthguards offer the highest level of protection, and if you have dental cover under your health insurance there's no out of pocket expense.